Judging by the low voter turnout in American elections—even in a presidential election year—some people just aren’t that into politics. But for a Christian, politics is not a choice; it’s an obligation, even if it is not always a passion. Has the Religious Right been good for American conservatism? One way to answer that question might involve looking at the success of the Republican Party since the election of Ronald Reagan in 1980. Since the votes of white Protestants who identify themselves as “born again” have been crucial to the GOP’s dominance of the White House for the last three decades, students of American politics would have trouble looking at the Religious Right’s influence as anything but positive, at least for Republican leaders and candidates. The problem of the church and politics is really just a part of the larger problem of how the church relates to society at large. In the American church today, some are alarmed by what they see as a catastrophic collapse of the church’s influence over society; many of them have sought to regain that influence through politics. 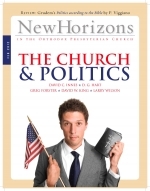 Others believe the true church never really had much influence over society and are frustrated by demands that we seek it; many of them have sought to keep the church out of politics. The sin of Jeroboam, son of Nebat, was a sad and tragic response to God’s goodness to him. The evil that he did in the sight of the Lord, and the Lord’s response to it, are most instructive to us as we consider matters of church and state.